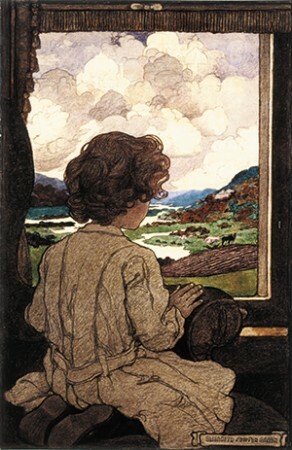 Elizabeth Shippen Green, “The Journey,” 1903. Illustration for “The Little Past by Josephine Preston,” Harper’s Monthly Magazine (December 1903). Oil on canvas, 28″ x 40″ x 3/4″. Collection of the Library of Congress. Stockbridge, MA, August 15, 2018 – Norman Rockwell Museum will present an evening with author and Rockwell Center for American Visual Studies Fellow, Barbara Tepa Lupack, Ph.D. on Thursday, August 30, starting at 5:30 p.m. Dr. Lupak will explore the role of magazine illustration and editorial/political cartoons in defining and popularizing the notion of the “New Woman” of the turn of the twentieth century. The author and editor of more than 25 books, Dr. Lupack is former Academic Dean and Professor of English at SUNY Rochester, and is currently a New York State Public Scholar. She received a Rockwell Center Fellowship Award in 2014 for her research on moral chivalry as depicted by nineteenth and twentieth century American illustrators. Lupack will discuss the work of artists Jennie Augusta Brownscombe, Jessie Wilcox Smith, Rose O’Neill, Elizabeth Shippen Green, and Violet Oakley and how their careers as female illustrators were shaped by the notion of the “New Woman.” The work of these women offers surprising insights into the age and culture, especially in the wake of the world war and the advent of the fight for women’s suffrage. The event concludes the Museum’s Thursday lecture and performance series this summer, inspired by the current Keepers of the Flame exhibit and the persuasive power of visual imagery in its many forms. The event is free for Museum members, or included with Museum admission. Parents and caregivers can enjoy our Thursday evening programs while their children are engaged in creative art and gallery activities inspired by the works on view. Children’s program is complimentary with adult admission to the evening program.